It’s been a while since I posted anything. I have been painting and doing other art related things, just not posting for various reasons. One reason I haven’t been posting is that I’ve been challenging myself in watercolors. As I’ve always said, they are much harder than oils. I’ve been doing more wet in wet painting and they just never turn out. My clouds look to heavy to float and my trees and leaves all run together. I know I will get better if I keep practicing, but I have accepted that it will take a long time. A couple of days ago I painted a scene from a photo I took a couple of years ago. I did not do a lot of wet in wet in this painting, outside of the sky. Maybe that’s why I’m happier with the way it came out. Snow is difficult because you need to leave the white white. There is no opportunity for error. I did mask some of the tree branches and one ridge on the ground that I wanted to really stand out. 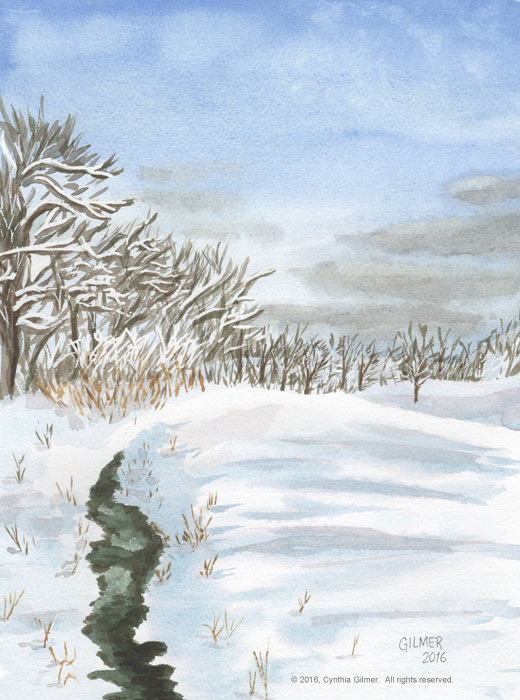 It was fun because it’s a nice winter scene. I also sold a print to someone who found me on the Internet, which is a first. She bought a copy of the Rockbridge Vineyard Chairs that I did for my friend Kathy a few months back. She wanted to give it as a Christmas gift to her sister-in-law who lived in Rockbridge County. They had visited the winery together. She told me how she searched to find me, but I have been unable to repeat it such that this painting comes up. Still I’m very happy she found me. The one other fun thing I did before the holidays. 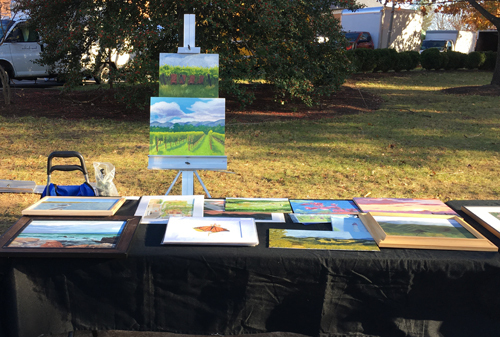 I showed my paintings with Falls Church Arts at the Falls Church Farmers’ Market. I didn’t sell anything, but several people took business cards. Maybe I’ll hear back from one of them. Regardless, it’s good exposure and I had fun. Happy Holidays and Happy New Year! I’m taking the next few days off from my day job so maybe I’ll have something else to post soon.